Update: No word on pay and perqs or Aliotti’s buy out deal, if any. Aliotti was getting $420K, see below. “The well is dry” for external equity raises for faculty, but it’s flowing freely over at Rob Mullen’s football operations offices, thanks in no part to the millions in subsidies he gets from the academic budget. There will be a report from the Senate ad hoc committee on ending athletic department subsidies at the meeting Wednesday (Full dislosure: I’m the chair). A vote is currently scheduled for the Feb 12 meeting, unless the ad hoc committee can work out a compromise with President Gottfredson before then. Things don’t look particularly optimistic at the moment. VP for Budgeting Brad Shelton refused to let me attend the Senate Budget Committee meeting on the athletic budget on Dec 11, a week after President Gottfredson gave his support for the ad hoc committee. 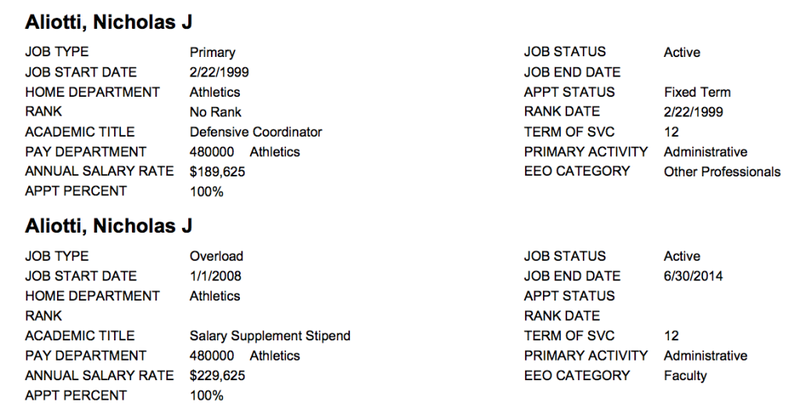 12/27/2013: Nike payments to inflate Aliotti’s PERS pension too? For those affected, it’s roughly a 2 percent hit. The PERS actuary calculated that a typical 55-year-old retiring Dec. 1 on Money Match would avert a 1.9 percent reduction in his or her pension that takes effect starting with 2014 retirees. A 65-year-old in the same boat would avert a 2.3 percent reduction. But those employees could make up much or all of those losses merely by working several months longer. The legislature had considered, but did not implement, changes that could have let to huge hits for “in-active” members such as the faculty who switched from PERS to the ORP in 1996. That uncertainly led to a least a few early UO retirements. These much smaller cuts are due to small changes in the death-tables and a cut in the assumed earnings rate for annuities. 10/8/2013: Ted Sickinger is an investigative reporter for the Oregonian. His piece on Mike Bellotti’s PERS scam was a classic. At retirement, Bellotti’s post divorce account balance was only $300,000. The university made its own contributions over the 21 years he was employed. But combined, they won’t come close to covering the $5 million benefit reserve that PERS established to cover his payments. … Then there’s the legal question. 10/4/2013: I confess I’m not following this or the government shutdown as much as I should. I’m in Italy for a few more days – a country with a relatively stable and responsible political system. Rep. Jules Bailey, D-Portland, likened the tax cuts to the Business Energy Tax Credit. The cost of that program grew so quickly that it became a political embarrassment and the Legislature has worked to rein it in. So, the biggest beneficiaries will be people like noted tobacco company lawyers Sharon Rudnick and Dave Frohnmayer? Kitzhaber got advice on the legality of the cuts from Bill Gary at HLGR. So maybe he’ll now make the DOJ hire HLGR, who lost Strunk, to try to defend this? Frohnmayer’s PERS COLA will take a big hit if it sticks in court, so he’ll have to balance that against his usual $550 an hour motivation. Keep an eye on the persinfo blog for commentary and analysis. Kitz to gut PERS, get tax increases? 9/19/2013: Christian Gaston has an excellent piece in the Oregonian on the deal and the politics. As usual Marc Feldesman has some biting commentary on his PERSINFO blog. I suggest reading all of both pieces, because the consequences for your lifetime income stream are likely to be significant. You might want to put that goat bonus into stocks. Uncle Bernie, you got any tips for us? From the news articles, it appears that they dropped the attack on PERS “inactives” i.e. ORP faculty. The plan was to reduce the annuity rate on their pensions to 4% or less, which would have reduced their pensions by 30 – 37% or so. The plan is so manifestly illegal, especially as regards ORP faculty, that they apparently decided to drop it and avoid a big lawsuit. Anyhow, if they had gone through with that plan, ORP and other inactives would probably have taken the “double lump sum” option, removing their money from PERS altogether, so it’s not clear the state would save any money. Uncle Bernie knows of ORP people who are planning to do the lump sum anyway. Everyone should be somewhat more motivated to do that than before, because the current proposal in Salem has rather sharp cuts in the COLA adjustments to PERS. They are 2% annually, and will be reduced quite significantly, especially for those with a relatively large pension, I believe it is $60K, above which the COLA will nearly disappear; below that, the COLA is reduced to 1.25%. I have no opinion about whether this will be deemed legal or not by the Oregon supreme court. There is is reason to think from the Strunk opinion of about 10 years back that it won’t, but the statute is written so vaguely that it’s really hard to predict what the court will do. Bottom line: PERS under attack, Uncle Bernie happier than ever to have gone ORP in 1996. Leaning toward taking lump sum out of my prior PERS account when retirement comes, be done with the state of Oregon, the people out to get public employee members for their pensions, the whole public pension mess. 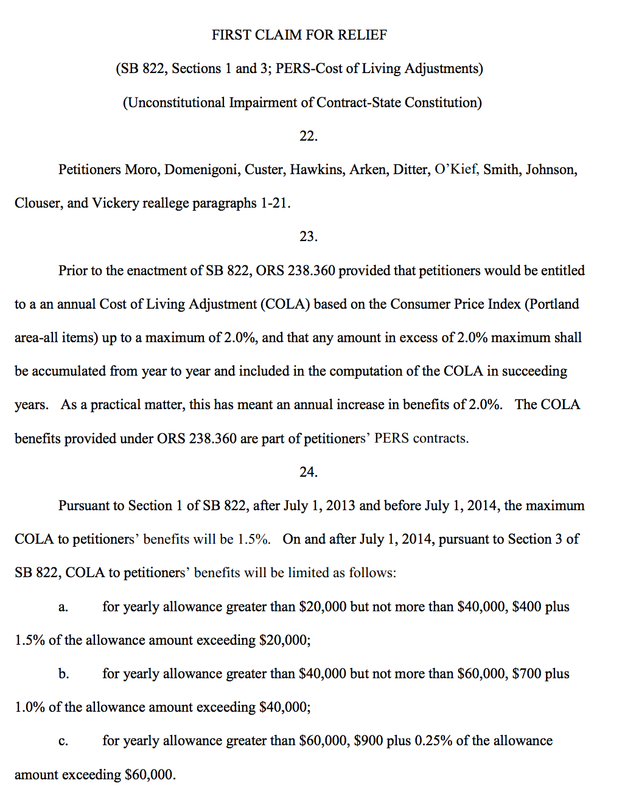 Unclear whether the PERS cuts will stand up in court, but want to be done with Oregon regardless. It’s all pretty sad, because Oregon has been one of the best states in keeping its public pension plan funded, it’s now ~ 90% fully funded and increasing steadily with the stock market surge that has been going on after the 2008 financial crisis. By comparisons, most states are far less securely funded, if you are in a public pension plan. The reason for all the trouble with PERS in Oregon is that the state stubbornly follows actuarial “rules” on the unfunded liability, i.e. ignores that the financial markets are solving the problem, and therefore keeps jacking up employer rates until the public understandably won’t stand for it anymore. With good luck, the PERS cuts will be stopped by the court, the PERS trust fund will be fully funded in a couple of years, and the attacks on PERS will abate. By the way, none of this really affects much whether the pension benefits at UO are substantially better than at other public universities. Unless you work for one of the few states (like Washington, which is 100% funded) in which the public pension plan is more securely funded than in Oregon, you are better off here. The public employee unions have not done a good job, to put it mildly, in representing any of this to the public, in my opinion. The UO administration is now arguing that generous UO benefits justify not getting UO salaries to AAU peer levels. However, while benefits at UO may be more expensive than those at our peers (though that’s an open question, see bottom) that does not mean that they are more valuable to faculty. In a nutshell, UO pays about 25% more for health care than employees get in benefits. The loss is equivalent to about 4% of salary for the average professor. UO pays as much as 33% more for retirement benefits than employees get in retirement value, making UO retirement benefits worth perhaps as little as 2% more than those at our comparators. UO also does not provide housing subsidies, and other benefits, that many other AAU publics provide. All in all I think the burden is on the administration to show that UO benefits are more valuable than those at our comparators – and they’ve made no serious effort to do this. Lots of ins and outs here, I’m sure it’s not all correct for PERS, and it ignores some twists. Comments are welcome – I’m talking to you, Bernie – and I will try to update this in response. It’s mainly about faculty but I think most of it applies to other UO employees. Health insurance costs UO $1260 a month, per covered employee, paid to the state PEBB health care plan. This rate is the same for all state employees. By PEBB’s own accounting, the Oregon University System is a net payer into the state insurance program. In 2011, PEBB estimated a fiscal impact of $51 million if OUS were to separate from the state insurance program. The SB 242 Financial Analysis conducted for this report estimates that if OUS had operated an independent health insurance program in 2010 and 2011, there would have been a savings of about $67 million for this two year period compared to PEBB with self-insured OUS medical and dental plans, and about $49 million if fully-insured plans had been used. Let’s call it $59M for the 2009-2011 biennium. OUS PEBB claims totaled $235M for the same period. So the subsidy is roughly 25%. OUS used this argument to try and get out of the PEBB system, arguing that it was wrong for student tuition to go to subsidize benefits for non-university state employees. The corresponding argument is that the value of UO’s health benefits to its employees is only about 75% of what UO pays in costs to PEBB. Way more complicated. The basic argument is that the state retirement plan, PERS, has a large unfunded actuarial liability, or UAL. The state has promised more to current retirees and workers than it has set aside to pay them, and now it is balancing the books, by increasing what UO has to pay in. These extra payments are not entirely of value to current faculty! In the meantime, current payments by UO for employee retirement benefits go in part to reduce the UAL for past retirees. If you want an illuminating anecdote, read Ted Sickinger’s amazing piece in the Oregonian about former UO football coach Mike Bellotti. UO paid only a few hundred thousand dollars into PERS for him while he was working. Bellotti’s benefits are about $500K a year, and his unfunded liability is about $10M. So, a good chunk of the money UO pays to PERS, ostensibly for your retirement, actually goes to pay for Coach Bellotti and others of his ilk. You’d have to be quite the sports fan – like UO VPFA Jamie Moffitt – to count this as a valuable benefit. Approximately 68% of PERS’ total accrued liability is for members who are no longer working in PERS-covered employment (retirees and inactives). As a result, approximately 33% of an employer’s contribution rate is associated with these groups. The 6% pickup contribution, paid by UO, goes to the PERS fund for old hires (I think) and into a separate fully funded defined contribution IAP account for newer ones. And if you opted into the ORP, all the money goes into an independent defined contribution plan. You’re not helping out Bellotti at all, you free-rider. Let’s say that, on average, retirement benefits cost UO 17.5% of salary, including the 6% pickup. If we trust PERS, 1/3 of that is a subsidy to current retirees. So, lets say the value to the average UO employee is a bit less than 12%. For AAU publics the average cost of retirement benefits is about 10%. Now maybe some of them are also dealing with UAL’s, using similar subsidies, so their value might also be less than their costs. 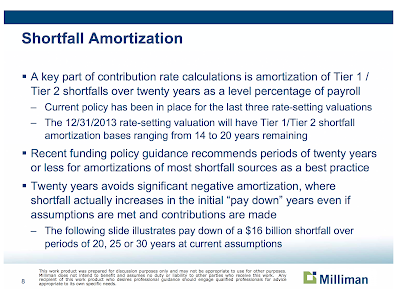 But if not – and keep in mind there are plenty of other caveats, most notably the ORP one – the value of UO’s retirement benefits is on the order of 2% more than our comparators, not the 6% number the administration trots out. Having strong retirement benefits will help put you on the way to a happy, prosperous retirement, but for extra financial security once your working days are over, you might want to receive support from a financial advice group such as Key, who can help you when it comes to matters of equity and annuities. Companies such as that can help when it comes to creating a budget for retirement so you aren’t left out in the end wondering where your money has gone. If you still don’t fully understand what equity you have in your home and how it can help benefit you in your retirement or would simply like more information then go to equityrelease.co.uk. UO has nothing. I haven’t done a real search, but here are a few programs by other AAU publics to help faculty buy houses. Many also have university owned, heavily subsidized faculty housing, typically used by new hires while they save for a down payment. 7/20/2013: Brent Hunsberger writes an excellent personal finance column for the Oregonian. His take on the impact of the SB 822 PERS COLA cuts is here. 7/3/2013: That was quick. From the law offices of BENNETT HARTMAN MORRIS & KAPLAN, full pdf here. For someone retiring with a $60K per year starting PERS annuity, the COLA cut in SB 822 would reduce the annuity 20 years out from $87.4K to $77.5K, and cost a total of $84K over 20 years. For someone like Dave Frohnmayer, with a current annual annuity of $257,373, the cuts will reduce the annuity 20 years out from $375K to $284K, and cost a total of $837K over 20 years. Replace “cost” with “save” if you are looking at this from the state’s point of view, and note that these costs or savings are not discounted back to present values. It just may die there. If these bills fail, there will be no cut to inactive benefits, no additional cuts to the retiree COLA, no phase out of senior medical deduction, and a host of other noxious tax increases. Democracy is messy. I personally know 5 UO faculty who retired early, losing substantial amounts of income, causing a moderate amount of disruption to teaching, and a lot of lost sleep and administrative time, because of fear the legislature would do something arbitrary and capricious to cut PERS ORP inactives with no warning. Sounds like we’ll go through it all again next session. It’s the last-ditch effort to raise more money for education and other state programs in exchange for deeper cuts into the Public Employees Retirement System. The Senate gavels in at 10:30, and the agenda includes House Bill 2456, which raises about $200 million in corporate, income and cigarette taxes, and Senate Bill 857, which puts further limits on cost of living increases for government retirees. The amendments discussed Thursday also included one further reduction to the Money Match program, beyond the COLA reductions. It would change the annuity rate on Money Match accounts for “inactive” retirees, or people who have left public service for more than three years and not re-entered. The current rate is 8 percent, and that would get cut to 4 percent. 6/27/2013: Read it all, from Mr. Fearless at persinfo.blogspot.com, regarding SB 857. Details here. Lest you think this bill isn’t going to survive the end of session games, think again very carefully. The bill has the support of the Governor, Senate R and D members, OSBA. OBA. It’s rising from the grave today as the Senate Committee on Revenue and Finance takes up two placeholder bills introduced last week. One provides space for legislation further cutting the cost of the Public Employees Retirement System and the other would allow for the tax deal. The committee meets at 2 p.m. in Hearing Room A. 6/27/2013: persinfo.blogspot.com is a great source for PERS news. While anything could happen, Mr. Fearless thinks that the inactives are safe for now, and that if the legislature does do anything more this session they will cut the COLA for everyone (even more than the SB 822 cuts) and appoint a committee to try craft legislation that might stand up in court to decouple the annuity payout rate from the assumed earnings rate. This would mean large cost savings for employers, and large reductions in the monthly annuity for new retirees. That would take legislative action, presumably next session. In addition, the PERS board is meeting in July and will presumably reduce the 8% rate to 7.5% or so, and update the death tables to reflect current longer life expectancies. These changes can be done administratively and will supposedly start phasing in starting in December. Word from people who know is that Tier one PERS (inactive or not) would have to work an additional 6 months or so to make up the difference, so people on the verge of retiring might consider speeding it up. On the other hand, another factor to consider is that the TRP plan has become significantly less attractive. Under the TRP you get a 6% pay raise when you sign up, and then must give up your tenure within three years, then UO must hire your for 3 years 1/2 time or the equivalent, spread out over more years. But as of a few years ago UO stopped making retirement plan contributions after you have given up your tenure and started working part time. For Tier One people this is effectively a 20.5% pay cut, and that’s pre-tax money. From a strictly financial standpoint it therefore may well make sense for potential retirees to keep working full time rather than plan on part-time work under the TRP. On the other hand you have to sign up for the TRP to get the 6% raise. At the margin I think this will mean more faculty will delay going on the TRP, which is quite cheap for UO, and so UO may have to sweeten the TRP deal in order to encourage higher paid full profs to retire. Of course that possibility gives yet another reason to delay taking the TRP. Public sector retirements this year are up 54 percent over last year, according to statistics kept by the Public Employees Retirement System. Workers say the proposed cuts in the legislature are driving their early exits. PERS spokesman David Crosley said 2,305 public sector employees retired last year between January and June. This year, 3,539 people have retired between January and June. Fortunately Salem has announced they will not raise the cost of dulling the pain. Revenue: Lawmakers would approve $275 million in additional spending by reducing medical care tax breaks given to the elderly; increasing cigarette or beer taxes; lowering personal income tax deductions; and raising corporate tax rates. PERS: In addition to the $460 million savings approved last month in Senate Bill 822, the state would save $440 million by further reducing cost-of-living increases for retirees and by changing the payout formula for workers who are no longer in the PERS system. Kitzhaber holds more secret meetings with legislators. Persinfo blog advises those who can, to consider retiring by 7/1/2013, to avoid getting hit by death table revisions. Rumor is that at least 3 B-school profs and several other quant types retired Friday 6/1/2013. The Oregon Republicans in the Legislature used a lazy Thursday afternoon, very late in the month of May to announce their newest “compromise” proposal on PERS Reform. I’m not going to bore you with too many details; you can read the proposal for yourself here http://oregonpers.info/Library/Download.aspx?docid=1542 . What’s notable about the proposal is that it contains every element of the former SB 754, with just a few of them scaled back in their extent. From here on out, I will refer to the new proposal as “SB 754 sorta lite”. The hands behind this bill are principally the Oregon School Boards Association (OSBA) and its umbrella group “Fix PERS Now” (see yesterday’s post). The bill is audacious in its scope, revisiting the retiree COLA even more punitively than before, it goes after inactives by proposing a cut to the Money Match annuity rate from the current 8% to 4% (the PERS Board will take up the assumed rate at today’s Board meeting and will undoubtedly cut it to 7.5% in July, to be effective for all retirements after December 1, 2013), “fixes” the Judges pension (how isn’t clear), ends pension spiking without completely eliminating sick leave (I guess you can have 40 hours) and vacation time, it redirects 1% of the IAP to the PERS fund your own retirement, offers flexibility to employers to renegotiate the 6% pickup, removes Legislators and other statewide elected officials from PERS, and creatively goes after OPSRP members (Tier 3) by reducing the accrual rates by 25 basis points going forward. It also raises the retirement age for OPSRP by 2 years. 5/31/2013: They’ve put 22% of their our portfolio into private equity. Earnings? PERS private equity picks: 5.59% annual over past 5 years. PERS stock picks: 2.52% over 5 years. The Russell 3000 benchmark? : 5.63% over 5 years. The comparison is even worse if you look at last year, disastrous if you look at this year so far. So why are they paying big salaries to state employees to schmooze with the private equity salesman and pick stocks? They had a few lucky years way back, and now they think they are Warren Buffett. Nope, just buy the benchmark basket. More PERS info here. Costs this biennium will increase by only 0.7% of salary, not 5.1%. So, she can now boost the UO raise proposal from 10% to 14.5%! Republicans make their PERS move. Kitzhaber … ? Plan C: Retire today. You have to drive to Salem and submit the paperwork at PERS by COB today. Rumor is that it will be a madhouse, get there early. Then submit your TRP plan retroactively like UO let Frohnmayer do (surely Doug Blandy will do the same for the rest of us, though he won’t answer my email about it) and get another part-time job to supplement your PERS. Retirement forms etc. are here. Their plan also calls for employee contributions to be redirected from their individual accounts into the main PERS fund; for Money Match accounts to be annuitized at 4 percent, rather than the current 8 percent; and to prohibit employees from using unused vacation time or more than 40 hours of unused sick leave in calculating their final salary. Kotek and House Majority Leader Val Hoyle, D-Eugene, have been clear in the past that none of these ideas resonate well within their party. That did not seem to deter Republicans. Ferrioli said they were searching for the “sweet spot” on PERS reform and weren’t in any rush to do it by the end of June, the tentative date for ending the current session. “Getting it done on time is not nearly as important as getting it right,” he said. So, perhaps there will be a window to retire early and get the 8%, if this does go through? What a mess. 5/30/2013: Christian Gaston and Esteve have more details here. This new story seems to suggest the inactives would indeed get screwed. 5/30/2013: Harry Esteve reports in the Oregonian: Is it just me or does he seem a bit skeptical? The bulk of the savings in the Republican plan would come from nearly doubling the cuts in cost-of-living increases for PERS retirees. Under a plan that passed with all Democratic votes, retirees who get more than $20,000 annually in PERS benefits would face smaller caps on yearly increases. 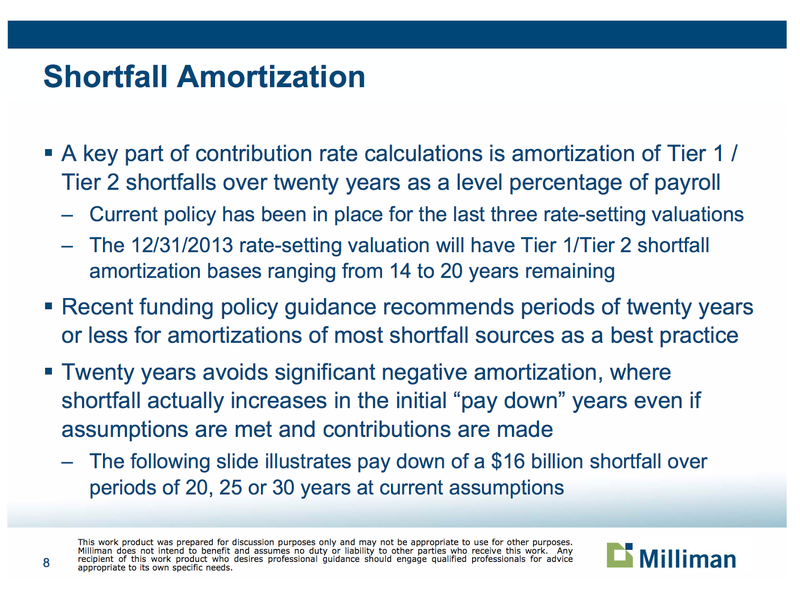 The current cap of 2 percent stair-steps down at higher benefit levels. In all, the plan shaves $460 million from the cost of PERS over the next two years. The Republican plan calls for steeper cuts, with stiffer limits after the first $20,000 in annual benefits. It would add another $447 million in savings to the Democratic plan. Other elements of the Republican proposal include reducing benefits for PERS members who no longer work in public jobs, reducing the employer contribution to PERS accounts and ending the practice of counting unused sick leave and vacation time toward retirement benefits. I think this means the inactive definition wouldn’t apply to current faculty? And the last doesn’t matter to the MM folks. But an end of the 2% COLA for amounts over $20K would seriously cut benefits. Assume you retire at 65 with $60K PERS. Currently you’d get $87.4K at age 85. Under this plan you’d get $69.1K – very unlikely to keep you even with inflation, not that I’m a macroeconomist. 5/29/2013: State offers SEIU swap of 6% retirement pickup for 6% raise. I don’t get the point of this. Anyone? And my post below is a little too paranoid – this is nothing new, just a centralization of existing special plans to work around IRS limits on the amount of income these highly paid employees can shelter under regular retirement plans. See below for OUS Counsel Ryan Hagemann’s prompt response. OUS Chair Matt Donegan will be at Matt court for President Gottfredson’s Investiture. If anyone goes, give him a shout-out about this. I saw in the announcement of the 3/15 meeting for the Board Committee on Governance & Policy that there was to be discussion of a special retirement plan for university presidents and coaches: http://www.ous.edu/sites/default/files/state_board/meeting/letters/call130315-GPFA.pdf and that OUS was hiring an administrator for this. I’d appreciate it if you could ask your public records officer, Chuck Triplett, to send along any public records describing this plan or proposed plan. I ask for a fee-waiver, on the basis of public interest in retirement plans, which is currently quite high given the various proposals to cut PERS for state employees. The reference to retirement plans in the March 15, 2013 Governance & Policy Committee docket was not a proposal to create a new retirement plan. The plans listed are existing plans of the Oregon University System. The materials were included as part of a discussion of services that might be shared if one or more of the OUS institutions achieves an institution board. Because retirement plans—now administered across the system—are complex and touch on the lives of employees, the Committee thought it a reasonable place to start in approaching the principles and substantial work that would be necessary to conceive of shared services. I have included the links to the materials that were used for this discussion on shared services and retirement plans. How a long-term, full-time faculty member in the OUS system could get hammered by changes aimed at “inactive” PERS members. first of the actions that the State subsequently took to reduce its PERS liabilities. investment, either in the variable account, or the fixed return of 8%. many of us have counted on in all our long-range financial planning over the past 16 years. What are the costs and benefits of the ORP? A faculty member who began employment in 1978, switched to the ORP in 1996, and plans to retire in 2013. This faculty member essentially has the first half of her pension in PERS, and the second half in the ORP. A faculty member who started work in 1990, switched to the ORP in 1996, and plans to retire in 2025. He had passed the years of service for vesting in PERS, but had a relatively small PERS balance in 1996.
a retirement income that will be between 10% and 24% less than if they had stayed in PERS. stayed at their university as full-time employees, for 35-year careers. faculty members this week, as they will not want to risk up to 55% of their retirement income. Hannah Hoffman delivers more potentially bad news about PERS, and every other state pension plan. Roller-coaster nego­tiations over how and how deeply the state Legislature should alter the Public Employee Retirement System this year have taken another twist. Oregon Democrats have declared themselves open to one final avenue of PERS reform, if the minority Republicans agree to provide the needed votes for $200 million in tax increases, probably aimed at high-income individuals and big businesses. The Democrats’ new PERS proposal, first presented by Democratic Gov. John Kitz­haber, would eliminate, or greatly reduce, the “money match” retirement formula for “inactive” PERS members — most often former state employees who haven’t yet retired, meaning their PERS pension accounts are still open. Good article, seems like anything could happen. Harry Esteve has more in the Oregonian. 5/27/2013: TRP not such a good idea? The ORP Plan document is clear that no contributions can be made to the ORP after faculty finish the tenured full time part of the program (up to 3 years). You can take a distribution from the ORP after the 3 years are up, but no further contributions until after the 5 year/3000 hour time is over. Same is true of PERS. Once an employee begins to take a PERS benefit no more contributions are made. Currently for Tier 1 facult UO pays about 22% of your salary, pre-tax, into the ORP. But that stops when you got on TRP. This reduces your effective pay while on TRP by 18%. Additionally, once you start taking the PERS benefits (typically when you start the TRP although I think that’s flexible) the total money match amount is locked in, so you lose what is (currently) an effective 16% rate of return on that, and in addition your annuity is reduced because you started taking it at a younger age. The TRP agreement is here. I couldn’t find anything about how it affects your UO health insurance – you get it for the quarters you are teaching? If you do 0.5 FTE TRP in a year do you get health benefits for the whole year? If you have a lot of pre 1996 years it still might might sense to try and jump the gun on the legislature. But for others it might be worth sticking it out, collect the UO contributions, and hope that the annuity rate cut is not all the way to 4% and that the courts will rule the cuts are illegal. 5/26/2013: Ted Sickinger reports on the PERS machinations in the Oregonian. DOJ doesn’t want to defend cuts just to inactives in court – easier if the cut is to everyone. Kitzhaber’s plan to cutting the assumed rate from 8% to 4% is back on the table. This means everyone close to retirement that has any PERS stake, active or inactive, should be thinking about retiring immediately, before the bill gets through. July 7 is the last day of the session. I assume you’ve been following the possibilities of substantial PERS changes that might result in large reductions in retirement income for many UO faculty. From what I’ve been reading it seems possible that the legislature might implement change very quickly, and that it might therefore be very advantageous for a fair number of faculty to go on the TRP immediately, before they are in place. 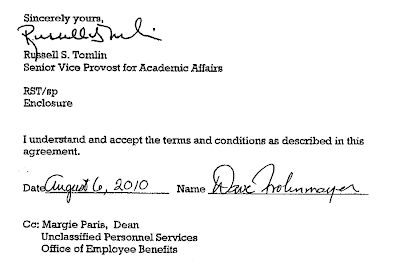 The attached TRP contract for former President Frohnmayer shows that your predecessor Russ Tomlin allowed Frohnmayer to enroll in the TRP program retroactively. I am wondering if UO has done this in other instances, if UO will extend that same courtesy to other faculty if this legislation advances, and what the rules for such retroactive enrollments are. I hope you can provide a quick explanation for the faculty, given the speed of events and the potentially large amounts of money that are involved. Subject: year of return after sabbatical? UO has traditionally told faculty that they must return for a full year at full-time after a sabbatical, or pay back their sabbatical salary. Secretary of State auditor Gary Blackmer has said that, actually, the relevant OAR (OAR 580-021-0220) just requires faculty to return for a year, and is silent on that year being full-time or part-time. Your predecessor Russ Tomlin has said that UO interpretation of the rule has sometimes not been enforced, and that some faculty have been allowed to use one quarter of part-time TRP time to count towards the year of return requirement. 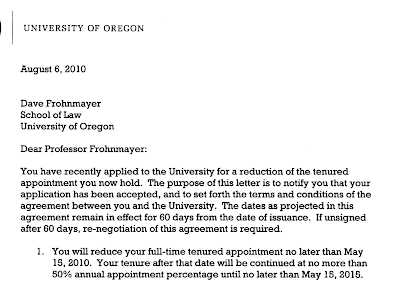 My question is this: Will UO allow a faculty member to use a full year of TRP work, even if only at 1/3 time, to complete the year of return sabbatical requirement, as the OAR rule allows? 5/25/2013: Frohnmayer retirement loopholes may help some ORP victims by allowing retroactive 600 hour retirement contracts and part-time work to satisfy post-sabbatical employment rule. Also see the latest PERSinfo blog post, here, and Hannah Hoffman’s blog at the Salem-Journal, here. Disclaimer: This is not financial advice, but it is something to think about very seriously. If Kitzhaber’s plan to eliminate the money match for inactive PERS members gets through the legislature, many UO faculty who switched into the ORP (TIAA-Cref, Valix, Fidelity etc) in 1996 may find themselves facing cuts in retirement income of as much as 50%. The PERS spokesperson has said that these people will likely be considered inactive, and therefore lose a huge chunk of PERS income, at least given the most recent language he’s seen. One way out would be to immediately retire under current rules, and go on the 600 hour program. This allows you to work between 1/3 and 1/2 time for up to 5 years after retirement. (So, for example, 5 years at 1/3 time, or 3 years at 1/2 time). This will be particularly attractive because the PERS hit increases the earlier you started at UO before 1996. Faculty close to retirement face the largest potential losses. It’s quite possible the bill could take effect in a very short period of time, giving people only a week or so to get this done. If you are anywhere close to retirement you might want to talk with your dean and prepare the 600 hours paperwork, which takes quite a while. You don’t have to sign it yet. 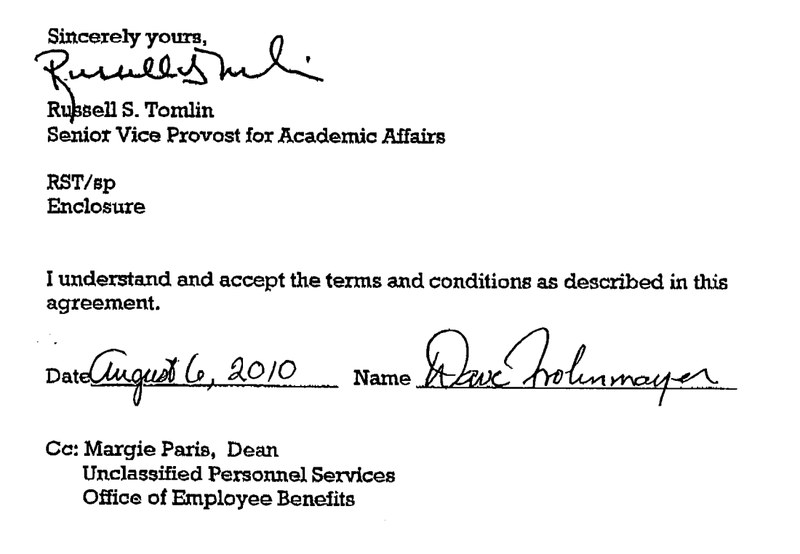 As explained below, VPAA Russ Tomlin let Frohnmayer sign his retroactively, but that doesn’t mean you’ll be allowed to! Another issue is that OUS rules and UO sabbatical contracts require you to repay your sabbatical earnings unless you work at UO for a year afterward. The VPAA has traditionally told faculty that returning on the 600 hours program does not count, you have to work full-time as a regular employee. So if you took some sabbatical time this year – even just one quarter – you could be in a serious bind: take the PERS hit, or repay $60K or so to UO. Fortunately, Dave Frohnmayer may have found a loophole that could work for others as well. His retirement contract did not include the clause about repayment of sabbatical money. He took the sabbatical his last year of regular employment, then retired and went on 600 hours. Back in 2011 I asked the state Audits Division to look into this and see if he should have to repay UO. Their report noted that his contract should indeed have included this clause, but that he didn’t have to repay anything because he had returned to UO for a full year of work afterwards. My take on their interpretation of the rules was that the VPAA had been misinterpreting them. One full year of post-retirement employment under the 600 hours program, even though it’s not full time, satisfies the post-sabbatical requirement. So, if you do decide to prepare for the potential loss of a major part of your PERS benefits by preparing to retire immediately, ask your dean and VPAA Doug Blandy if UO will also apply this interpretation to you, and count a year of 600 hours employment as satisfying the post-sabbatical employment requirement. I wanted to let you know that I am the audit manager at the Oregon Audits Division that is your contact person for the concerns surrounding former President Frohnmayer’s contracts. If you have any additional documentation, you can forward it to me. Also, I would appreciate it if you could direct me to the appropriate OAR or OUS Policy that requires sabbatical salary to be returned if the academic staff member does not return to regular full time employment. I reviewed OAR 580-021-0220 which requires the staff member to return to the institution for a period of at least one year, but I do not see anything that specifies service must be full time. Thank you. Just back from vacation this morning. my watch, following prior institutional practice. The full set of Frohnmayer contracts and the auditors report are here. 5/23/2013: Kitz plan gets more support. Hannah Hoffman reports. No updates on whether or not this would affect the many current UO employees who shifted from PERS to ORP in 1996. 5/20/2013: Panic update: Hannah Hoffman reports that negotiations are on again. One mathy prof reports that this would cut his retirement income by 40%. 5/16/2013: Hannah Hoffman has the news that Kitz has bailed on this plan. The Republicans aren’t willing to raise taxes on the richest 2% in exchange. And state tax revenues are up. And the stock market is up so much that PERS is back to looking fairly robust. So PERS looks safe for this session at least. 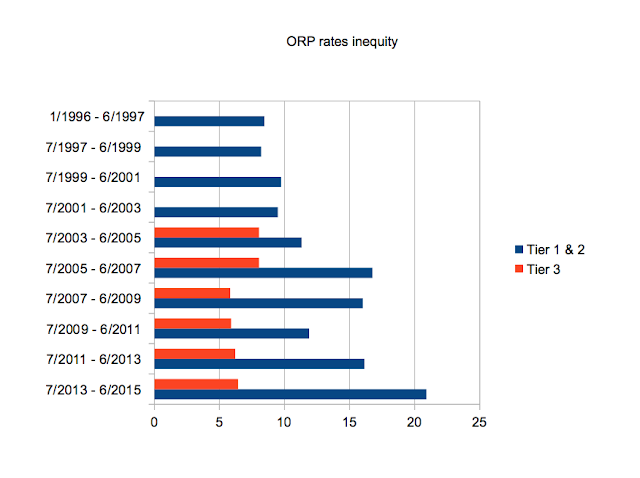 5/15/2013: Too early to panic, but many UO faculty switched from PERS Tier 1 to ORP in 1996 when it was introduced. Their PERS balances have accumulated since then, and when they retire they typically use the money match formula, which doubles the balance, which they then take as an annuity. This is presumably how people like Dave Frohnmayer get $257K a year in PERS, even though his salary when he left the plan was only $121K. Obviously the deal for most faculty is considerably smaller, but still potentially $50-60K a year. The reports on Kitzhaber’s new plan say it would prevent people who have left PERS from getting the money match. Instead they’d have to use a considerably less generous plan, based on their last years of earnings while in the plan – i.e. 1996. No inflation adjustment! Would this also apply to UO faculty who switched out but still work for the state? Not yet clear. Also not clear if this will get through the legislature – the Democrats and unions are opposed, but it may be the price of income tax increases for the top 2%. … “inactive” is anyone no longer in the PERS system. That would include anyone who left it for another retirement plan. If the employer isn’t making contributions to PERS for them, and they aren’t contributing to PERS, they won’t count. It’s all preliminary, and there may be exceptions, but it looks like it would apply to these faculty. I am acutely aware of this situation and am working with OUS on the definition of “inactive” and how that applies to ORP participants. If a non-vested Tier One or Tier Two member elects the OUS Optional Retirement Plan (ORP), the member’s account is transferred to the ORP and membership in PERS is terminated. Vested Tier One or Tier Two members who elect the ORP may leave their PERS accounts intact or transfer their accounts to the ORP. Those who leave their accounts with PERS become inactive PERS members. To the extent any legislation affects inactive members, they would be affected as would any other inactive member, with the hedge that the actual impact cannot be determined until the actual text of a bill is reviewed. Vested members who transfer their accounts to the ORP terminate PERS membership. There’s more in the persinfo blog here, under “Train Robbery”. 5/27/2013: Potential changes in PERS make this workshop a must for all UO faculty. Friday at 8PM, in the Lariviere smoking lounge at the UO Faculty Club. Dave Frohnmayer will open with some advice on how to negotiate a fat golden parachute to supplement PERS. Step #1 is to convince your colleagues you’re dead wood. Mike Bellotti will explain how to get a $500K annual PERS payout using Nike money that UO funneled to him without paying a cent into the state fund. Bob Berdahl will show how to leave UO in 1986 with a $64,000 salary and then collect $115,000 a year from PERS for the rest of your life. Club Steward Russ Tomlin has agree to relax the usual men only smoking lounge rule, so that UO’s lady faculty can benefit from a special talk by the former (and current) Mrs. Colleen Bellotti, explaining how a quickie divorce and remarriage can add $50K to your PERS take. The workshop will conclude with a video address from Governor Kitzhaber, explaining how much he will cut your pension in order to pay for the benefits the people who retired before you are pocketing. 4/8/2013: Update: Marcin asked me to move this to the top of the blog, in case people had additional comments. In short, the inequity between tier 1/2 (all those hired before 2003) and tier 3 members (hired in 2003 until now) is ENORMOUS and it will be even BIGGER starting in July 2013. Currently (until June) Tier 1/2 members are getting 16.14% employer contribution, whereas Tier 3 members get 6.21%. In July, Tier 1/2 will be getting 20.90%, whereas we tier 3 will experience a minimal gain to 6.42%. 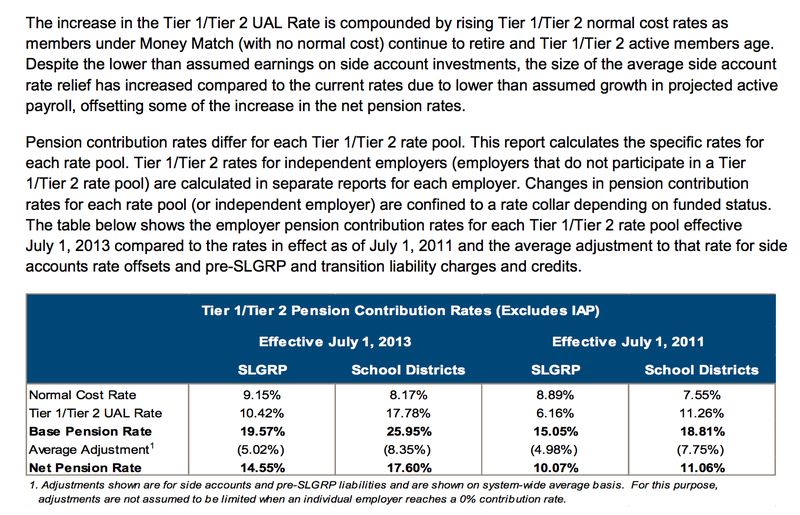 That is, Tier 1/2 will be getting 14.48% more of their TOTAL salary toward retirement than Tier 3. Fortunately for Tier 3 members the university pays 6% employee contribution for all tiers. However, “the 2013-2015 Employee Contribution rate is subject to legislative, executive, management or collective bargaining action”. So we cannot be sure of that. I think this is shockingly unfair and something has to be done about it. Note that 14% difference in total compensation package (salary+benefits) is much more than the salary raises we can dream of in the next few years. Do you think anything can be done to reduce this enormous inequity? Fun graphic from Mark Friesen in the Oregonian – mouseover the dots and see the retiree’s name, final salary, and retirement benefits (you gotta follow the link here, below is just a screenshot). The accompanying article by Ted Sickinger makes a lot of interesting points about how haphazard current payouts are under the money match formula, and analyzes the reform proposals. I won’t try to summarize, except to say that Frohnmayer got bumped from #5 to #6 by an oncologist – even after his $5K COLA. Read it all here. Composite employer contribution rates for state agencies are slated to increase from 15.57% for the current biennium to 19.84% for the 2013-15 biennium. This measure, coupled with the action of the PERS Board, would reduce the composite rate to 15.47%, or by 4.37% [Sic. They mean 4.37 percentage points.] Local government, the Oregon University System, and other PERS entities should see similar reductions in employer contribution rates. That’s a 0.6% *decrease* in PERS costs. Presumably the other bills would significantly cut UO’s costs. It will be interesting to see Moffitt’s new math. There’s now some log-rolling going on with the Republicans, on cuts to the amount of federal deductions allowable on Oregon income taxes. Follow the Statesman Journal’s Hannah Hoffman’s tweets for more. 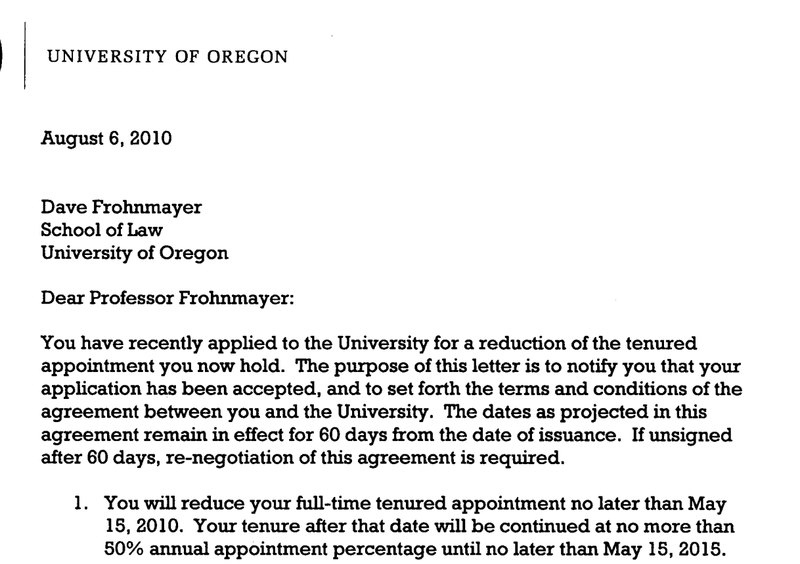 3/22/2013: It looks to me like UO’s retirement costs are set to increase by 10%, or about 0.6% of UO’s total budget, not by the 30% for PERS that Moffitt claimed. And even that increase may well not happen. At union bargaining session XI UO’s VPFA Jamie Moffitt said she’d been told to budget for a 30% increase in PERS costs, and that this limited UO’s ability to make raises. 30% sure sounds scary. Here are the numbers, taken from the OUS guide here, and including FICA. Extrapolating to UO’s ~$200 million payroll, these PERS increases will cost UO in total about $5 million, or about 0.6% of UO’s total ~$800 million budget. Not so scary. About half of that 0.6% is for bargaining unit members. And it’s ignoring the fact that the IRS now prohibits UO from paying PERS or ORP for the part of salaries over $205K to $255K (depends on plan. Too bad that law wasn’t in place for Bellotti and Frohnmayer). This binds for Gottfredson, Bean, Espy, the Moffitts, and many (most?) 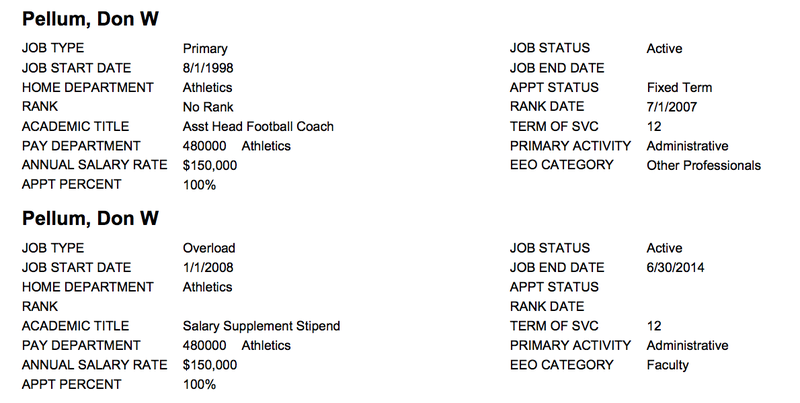 coaches and assistant coaches, and drives the cost increase down a bit more. But is even this 0.6% cost increase going to happen? Not if Kitzhaber and the Legislature have their way. Still, couldn’t their PERS reforms fail in the courts, so UO might have to pay more later? HLGR attorney Bill Gary recently did a legal analysis of this, and he thinks the COLA cuts are legal. And Gary charges $500 an hour, not Rudnick’s pitiful $400. So I’m going to go with the really, really expensive lawyer, and conclude that this is all a red herring. Nice try though, Jamie. — Retirees would receive the current 2 percent increase on the first $20,000 of retirement income. The COLA would decrease to 1.5 percent on income between $20,001 and $40,000, 1 percent on income from $40,001 to $60,000, and 0.25 percent on income above $60,000. That saves $400 million. — The PERS board would be asked to set aside $350 million in employer increases that were supposed to be paid into the retirement system over the 2013-15 biennium. Devlin and Buckley said that would give the state time to recover some of the money lost to the stock market dive of 2008. Looks like Gottfredson can give the faculty merit raises *and* keep Kilkenny’s baseball program. Or dump baseball and get the faculty up to our comparators.